For company cars and trucks, everyone knows that consistent oil changes are important, and so are wheel alignments and tire rotations for that matter. When it comes to the cosmetic upkeep like car washes, many people are willing to let those things slide to save a little time and money. As a frugal entrepreneur, I've definitely been guilty of doing this in the past. Unfortunately it's not usually a good long term choice. While you may be saving a few bucks now, avoiding car washes may be setting you up for an expensive trip to to the local body shop. Besides making your company vehicles look oh so shiny and clean, regular washes and waxes are important to keeping your vehicle’s body healthy. Waxing the car isn’t just for dad when he’s bored on a Sunday. It’s a very important part of the process. Skipping it is like not using floss and toothpaste when you brush, but we’ll get to that in a bit. It's your company's name on the cars or trucks so you don't want them to look like they've never been cleaned. It obviously reflects negatively on your company since people will associate your fleet's neglect with the attitude of your business. Just like you need to dress for success and keep your workplace clean, it's crucial to keep your company vehicles looking pristine and professional, if for no other reason than the sake of image. First let’s talk about why those washes are so important. Your car’s body picks up a lot of dust and grime while driving. Anyone who drives a dark car can tell you that. All of that grim slowly chips away at your vehicle’s paint, exposing the sheet metal beneath. Winter is especially rough on your vehicle’s exterior. Though salt is great at melting the ice on the road, those same properties make quick work of your exterior. And once the sheet metal is exposed, the rust moves in and gets very comfortable. And it’s a greedy, hungry guest. Once it starts eating at your sheet metal, it can be tough, and expensive, to eradicate. Not only is rust unsightly, but it can expose vehicle components to the elements that are not meant to be exposed. A clean car can even provide a safer experience for the driver due to psychological factors. For a lot of people a clean and shiny car will get more attention on the road and cause the drivers around you to pay closer attention. There are even some people that will drive more carefully around a car that looks more expensive for fear of hitting a valuable car and potentially owing more money to the driver or insurance company. So what’s a driver to do? You guessed it: car washes. So where does the wax come in? Wax acts as a protective layer once your car’s body is clean. It works to prevent debris from making contact with your paint, including that wicked bugger salt. UV rays from the sun are also harmful to your paint. Wax helps to block out a good part of this harmful radiation. Protecting your car through washing and waxing can end up saving you a lot of money in the long run. Did you know that a clean car can even promote better fuel efficiency for your vehicle? Although there have been earlier statements that dirt particles create an aerodynamic effect similar that of to a golf ball, this simply isn’t true. 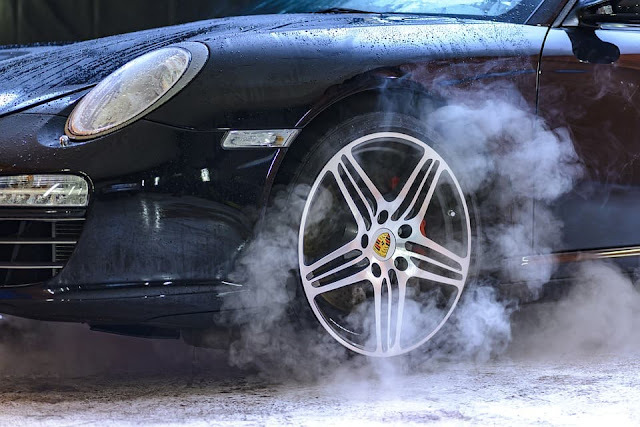 The dirt on your car creates drag, which causes your car to burn more fuel. Tests have proven that a clean car is 10% more fuel-efficient than the same dirty car. It's always great to save on fuel, and your fuel savings might even cover the costs of getting a car wash or washing your own automobile. And if you are managing a whole fleet of company vehicles, the increased gas mileage can really add up over time. I hope you enjoyed this article about the benefits of consistent car washes for your company car, business fleet, or personal vehicles. Interested in more articles about business transportation?